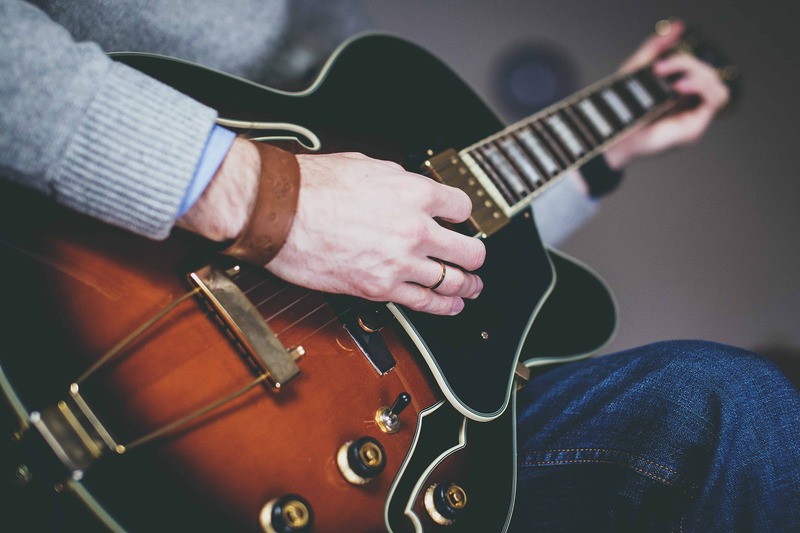 It may not seem like a huge deal, but having the right guitar chair can help improve your posture and make your practice time more enjoyable. They can also be a great item to bring with you if you are ever performing. Having a comfortable chair that you can trust can help ease the nerves when you are sitting down in front of a crowd. 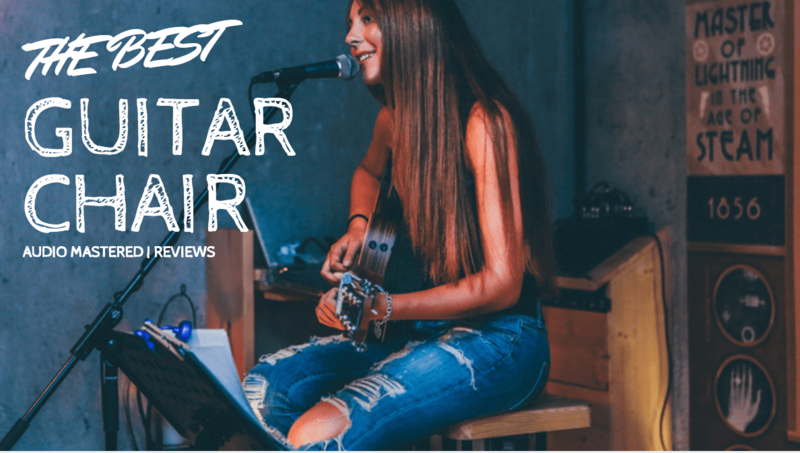 This article will give you a few ideas of the best guitar chairs on the market. Full disclosure: I tend to not follow the conventional advice when it comes to ​practicing chairs and postures. My preferred practice position is leaning back in my computer chair with my feet on my desk. 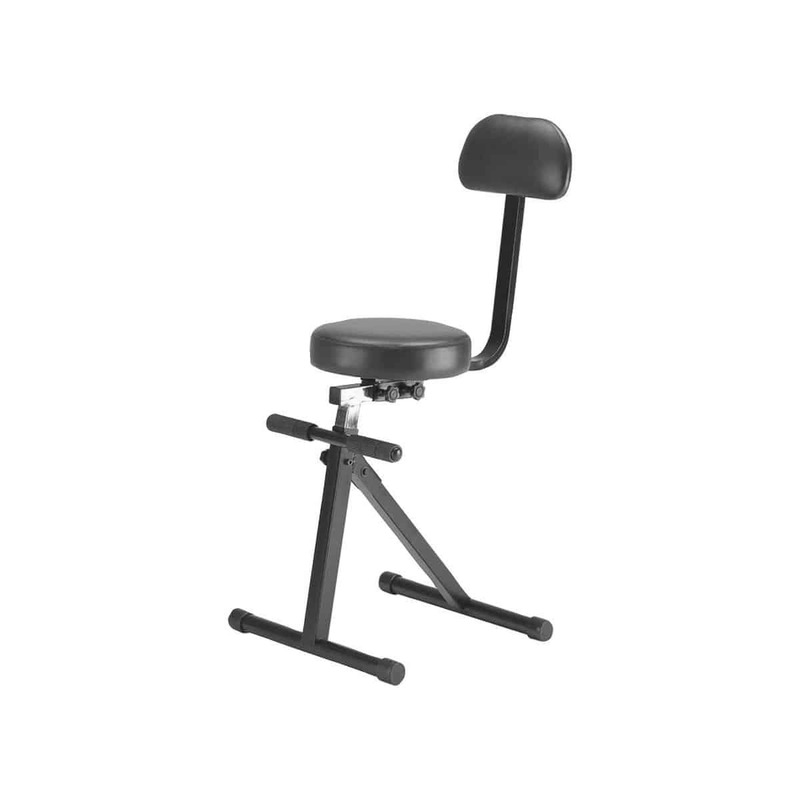 However, when I am practicing to improve my technique, I tend to switch to a stool in order to have enough room to get into the right posture. ​Let's quickly discuss a few of the main factors you should be looking for in your stool and then discuss a few of the best options on the market! As I mentioned in the intro, 70% of my guitar playing is done relaxing back in my office chair with my feet on my desk (I can feel the experienced guitar players cringing). I've been able to find the right angle to sit comfortably and rest the guitar against the ​arm rests of the chair. This position lets me relax and stay comfortable for long periods of time. However, this position is terrible for any skill practice. You are severely limited in the motion of both arms and I have difficulty moving quickly over the fret board. When I'm looking to have deliberate practice or if I'm playing with my band members I prefer to be sitting on a small, comfortable stool with plenty of space for my arms. The best guitar stools will have no arm rests, a small back support, and ideally somewhere to rest your feet if you have short legs. 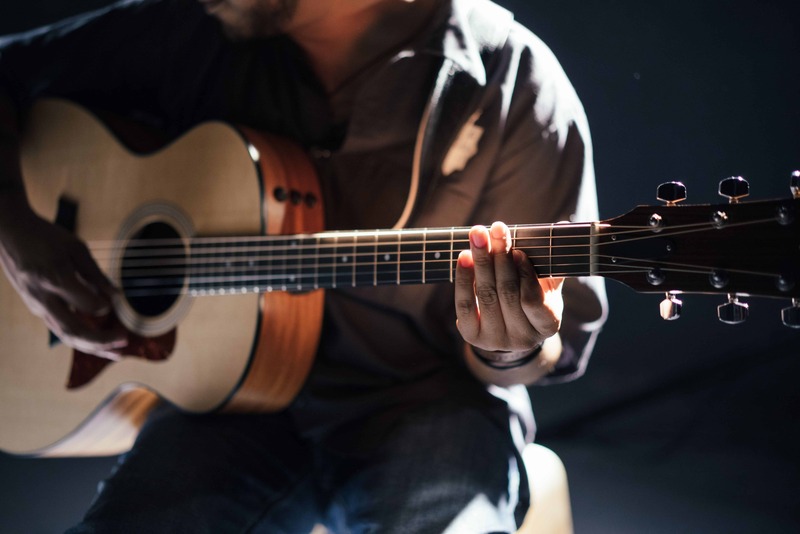 You really need to have the mobility of your arms to transition over the fretboard and change strumming patterns and angles. 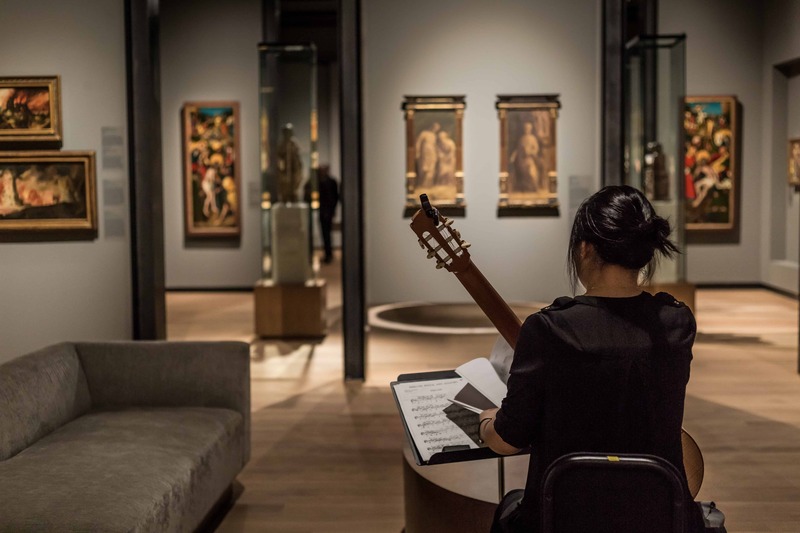 The downside is these chairs can be cumbersome during long practice sessions. I generally keep my deliberate practice around one-hour lengths to reduce any back fatigue. There are a few chairs that score highly on portability and adjustability. ​ They fold down and collapse to make for easy transport. You're going to want to also look for something that is lightweight. Most of these chairs will be made out of general grade steel box tubes to cut down on costs. The lightest option on our list is around 17 lbs with most others around 30 lbs. We obviously all come in different shapes and sizes. Therefore there isn't going to be one best guitar chair to suit everyone's body shape. However, you can purchase a chair that has built in adjustability to suit your personal preferences. 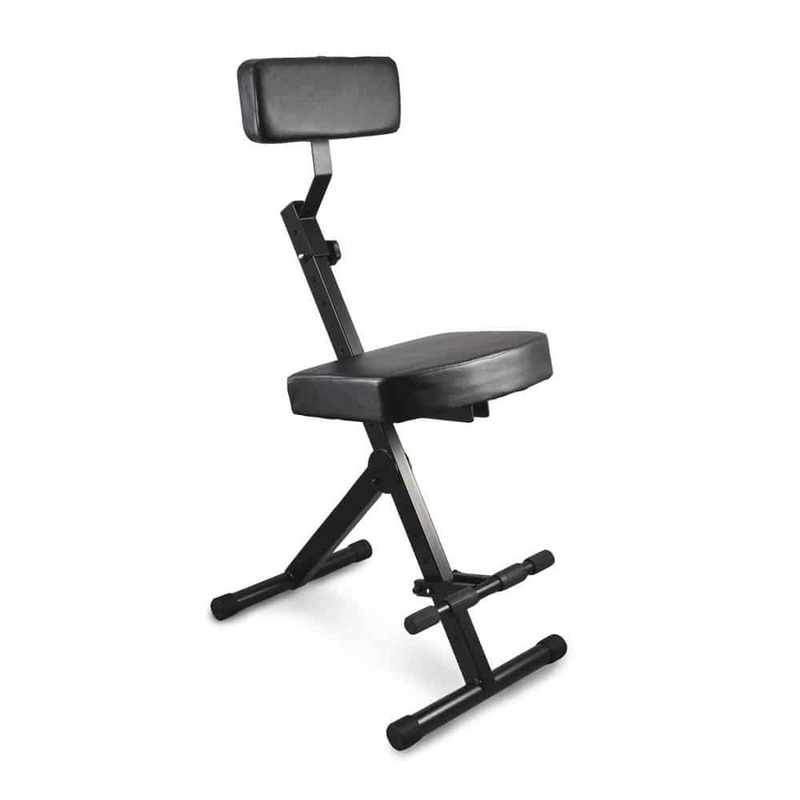 Ideally, you are going to want to find a chair that will allow you to adjust the back support and chair height. While you want to have your back in an upright posture when playing, having a back support can drastically reduce any fatigue and help get you through the long practice sessions. Most chairs only allow you to adjust the back support height and not the angle. ​There are also a few options with leg rests. This can be great for someone with average leg sizes to help prop your knees up while resting the guitar on your legs. If you are taller, this may be more of a nuisance. Another feature that I should really have to mention is comfort. While some of you may wonder why some people can't find the time to practise, I know there are a number of you who require a certain amount of willpower to keep the daily practice going. Your guitar chair should hinder you efforts. Instead, it should beckon you from afar, pulling you into the 2-hour practice sessions. It can be difficult for companies to produce chairs that will be perfect for everyone. You are going to have to take your own situation into account when making the final choice. If you are tall, you'll want something that meets all the adjustment requirements outlined above. ​This is the best way to avoid the chiropractor. Another factor you'll want to consider is the seat size. Small seats create pressure points and can restrict blood flow (if you've ever sat on a road bike seat for a few hours you'll know what I'm taking about). ​This can be especially painful for heavyset people. In this case - the larger the cushion the better. Don't spend more than $150. There are plenty of great options available for under $150. Save your money for buying your next guitar, or upgrading your strings etc. As always, durability is something to look out for. The material of the seat should be resistant to any scratches or abrasions. Vinyl is always a great option for durability. ​ Keeping an eye out for quality adjustment knobs will help the lifetime of the chair if you are constantly adjusting the height. Unfortunately, you are limited in terms of the level of stability. While these chairs won't be easy to tip over, they won't be as stable as a conventional dinner chair. Just something to keep in mind. There have been a few comments regarding chairs tipping over if you lean forward. My favourite chair of the four. The Quik Lok DX749 Deluxe Seat is one of the better quality guitar chairs on our list. You are able to adjust the height of the seat and the backrest. You are NOT able to adjust the angle of the backrest. This chair is very sturdy and durable. It is however quite heavy compared to the other chairs on our list. If you will be transporting the chair from gig to gig you may want to consider picking up a lighter option. This chair is best for those looking to buy a chair and leave it where it is. There have been a number of comments praising the level of padding and durable build quality. The seat is wide enough to fit all body types but if you are someone who is very picky with comfort you may want to consider another option as the backrest angle cannot be adjusted. Bottom Line: A great option for those looking for something that is sturdy and will last. Not the best for transporting. It offers some of the most adjustability while still covering a lot of the other basics. It's one of the lightest guitar stools on our list and will fold down completely for transport. This guitar stool will fit many body types. There have been a number of positive comments from people who have had trouble with other guitar stools being too small or too big. This chair offers a lot of versatility while still being sturdy enough to support heavyset people. 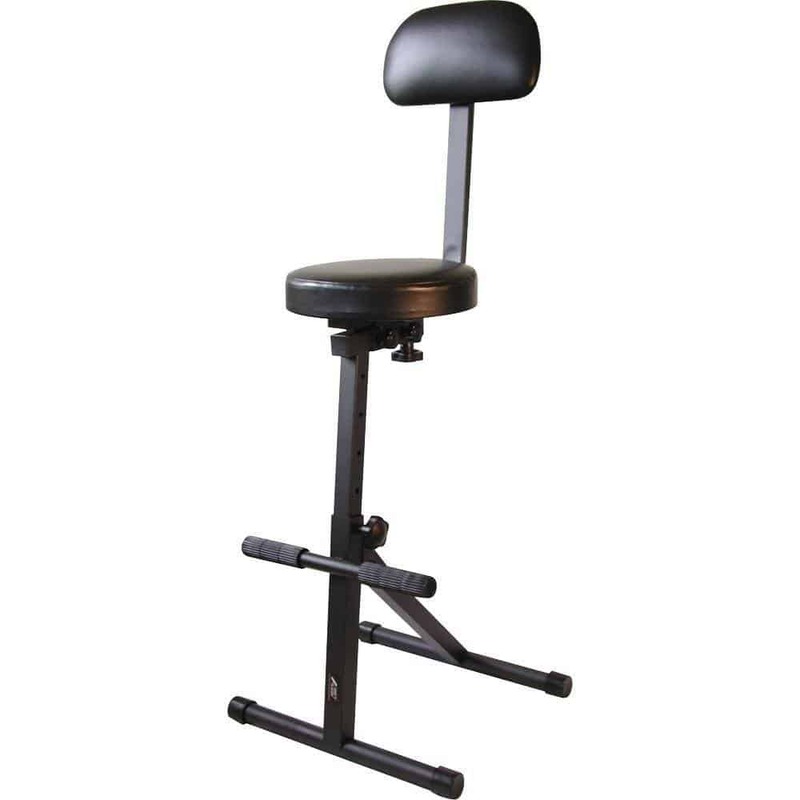 The stool comes with a foot rest and adjustable back support. A few people have mentioned that the padding could be improved but is good enough for reasonable practice sessions. If it weren't for a few reports of a lack of build quality and comfort, this chair would have the potential to be a contender for the top of the list. It checks a lot of boxes for those shopping for a guitar stool. For starters, it's completely foldable. Perfect for storage or transportation. It is competitive when it comes to weight so nothing to worry about here. The seat is wide enough to fit all body types and it can be broken down for transport. ​The backrest is adjustable and all other components can be altered to suit your specific needs. Unfortunately, there has also be a few notable comments about the lack of comfort. There have been a few complaints that you are not able to use this chair for extended periods of time. The foot rests have also been reported to be unusable. 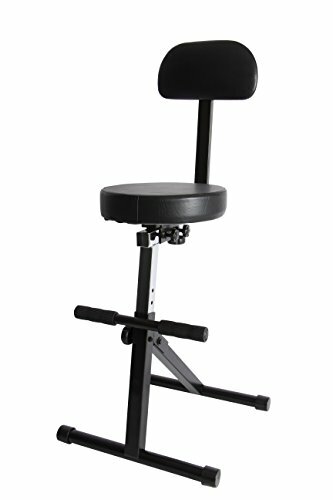 UNIVERSAL APPLICATION: The Pyle Musician Stool offers maximum comfort for musicians for virtually any venue - from beginner to professional applications. Perfect for musicians, instrument players, sound engineers, guitarists, drummers, pianists, etc. PADDED SEAT/BACKREST: Features a padded seat and backrest cushion for comfort so users can have a great time playing musical instruments. 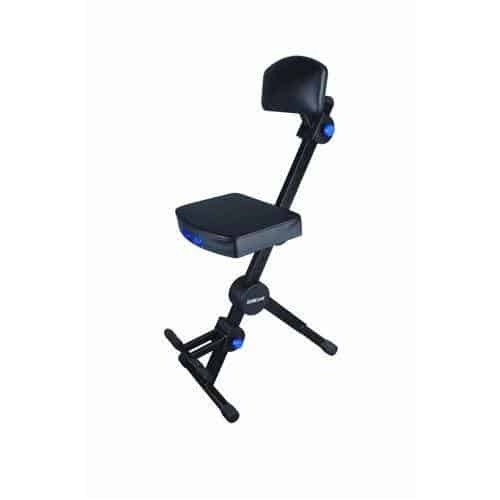 Provides back and footrest support. Seat cushion: 16.4" x 12.3" x 2.4"; backrest cushion: 12.7" x 5.5" x 2.4"
Bottom line: I'd recommend giving this one a pass. A strange misstep from an otherwise amazing company. Another solid contender. Simplicity and price are the most attractive features with this guitar chair. There is some adjustability, but not as much as the other chairs on out list. It also has a weight capacity limit of 240 lbs which can be limited for heavier set people. On the plus side, the chair is very light. Weighing in at only 17 lbs it is one of the lightest of our picks. There have been many positive comments on the durability and build quality - a definite plus. I'd recommend this chair for anyone who is on a budget and isn't really looking for all the bells and whistle. Sometimes, the less moving parts and adjustments the better. There is less potential for defects or for parts breaking. If you are looking for something simple and durable, this is the chair for you. Bottom Line: The best option for those looking for something simple that gets the job done. While all of the above chairs will be great for guitar the end choice is up to you. 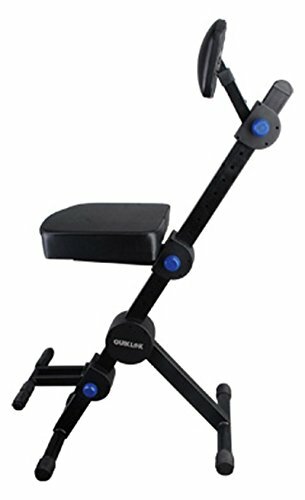 If you're like me and don't really need to have the correct posture at all times when playing then you may want to branch out into something a bit more comfortable. While the above chairs will allow you to have the correct posture, they can be painful to sit on for hours at a time. Make sure you focus on the features you need and forget about any features you don't. Tall? You'll need something adjustable. Need something with a wide seat? Avoid and of the round seat cushions and go for something that allows a little more blood flow. If you have any other recommendations leave them in the comment section below! Until next time!